Jumping out of a plane at 10,000ft! Now, this is way out of our comfort zone! Bristol Accountants aren’t best known for their skydiving antics! But, we are committed to helping our chosen charity St Peter’s Hospice, Bristol’s only adult hospice, so our bravest team members are prepared to go the extra mile, or actually 10,000ft. 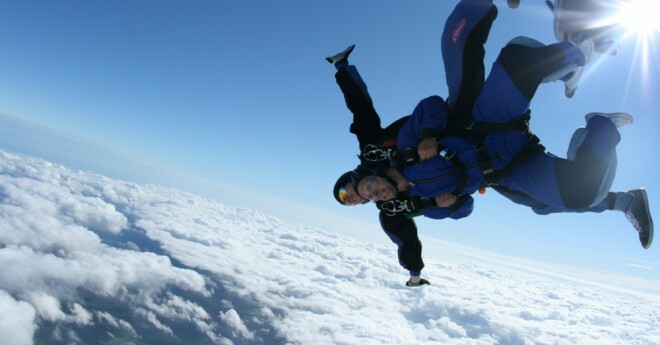 On the 24th October, somewhere over Salisbury plain, look way up in the sky and you should see the figures of Sam Weston, our excellent Client Services Manager and Helen Coles, one of our Accounting Professionals and our in-house XERO expert, leaping from a plane for the jump of their lives! St Peter’s Hospice is worthy of throwing yourself out of a plane too. Several of our staff have experienced at first hand, the tremendous work they do for people with life-limiting illnesses. It costs about £18,000 per day to care for just one person and a large percentage of this money has to be raised from donations and fundraising. Our target is £1000 which is a big ask, so we are appealing to everyone we know to help. If you feel you can support St Peter’s and donate to our brave skydivers, then please click here to go to JustGiving. Thank you from Evans & Partners and St Peter’s Hospice.